I'm a little sad today, it was a coworker's last day at our work and I'm sorry to see him leave because he was always fun to work with. We celebrated by going out with the work crew to a local cantina for drinks and food and we all had a great time. I think everyone will miss him tomorrow when we see his empty desk. I'm sure he's off to bigger and better things, so I'm happy for him but I hope he stays in touch with us. Do you still keep in touch with coworkers who have come and gone? Tonight I have my final Contrary Polish from the Spring Love Lyric's collection called Ain't No Sunshine. It's a lovely dusty blue with silver flecks mixed throughout. I think it's fairly unique in that I don't see a lot of polishes anymore with monochromatic flecks. I wish there were more polishes like this out there, but unfortunately there aren't very many. Revlon Royal Cloak, one of my all time favorite polishes, comes to mind. The formula on this was excellent, I had no issues with pooling or streaking and I only needed two coats for opacity. It dried to a satin finish on its own so I used a layer of SH Insta Dri for shine. Isn't that just gorgey? 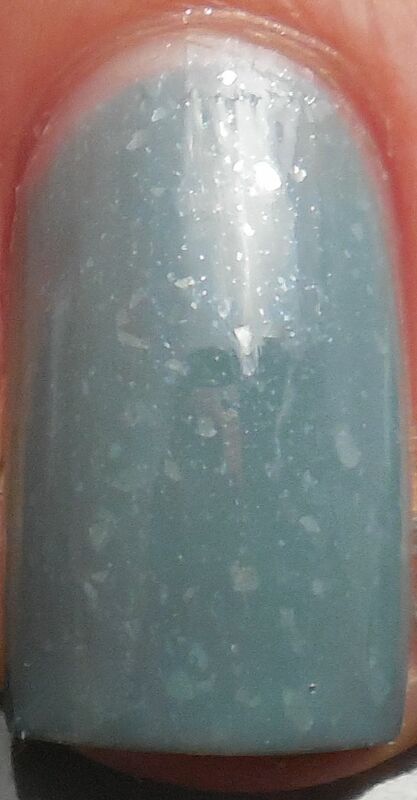 Do you know of any polishes that have flecks similar to this? Another polish that comes to mind is China Glaze Ahoy but maybe it has smaller glassflecks. This is so pretty on you! I really love this one. And actually, I do know of some similar polishes - Smitten Polish recently released a collection called Berrydrops that is comprised entirely of pastels with this finish. Gooseberry Gumdrop (the green) is my favorite. thank you for the suggestion! I will check them out right now. Smitten polish always has great colors. I hope your wrist is doing better.